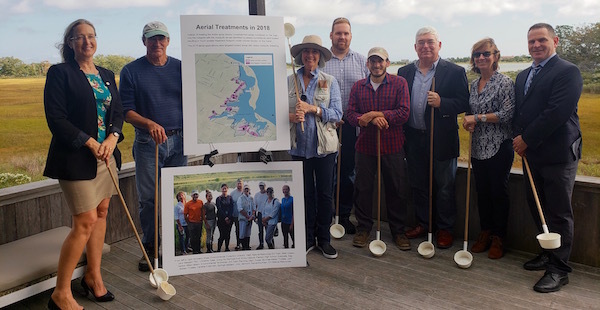 Environmentalists in East Hampton are celebrating an innovative program that has enabled the reduction of the spraying of Accabonac Harbor in Springs by 50 percent. In 2017, Suffolk County Legislator Bridget Fleming brought together a cooperative team with representatives from The Nature Conservancy, Suffolk County Vector Control, the East Hampton Town Trustees, The Town of East Hampton and 10 volunteer citizen-scientists to collect mosquito samples throughout the harbor to give the county a much better picture of where mosquito spraying was needed. The program was implemented for 11 weeks of the 2018 Suffolk County Vector Control spraying season, which runs from May 21 through Sept. 21. Led by Nicole Maher of The Nature Conservancy; East Hampton Trustees Susan McGraw Keber and John Aldred; and Mike DeLalio, an Environmental Technician with the Town of East Hampton Planning Department, program participants collected dip samples at almost 6,000 GIS data points over the course of the summer to test for the presence of mosquito larvae. Dip data was identified by GIS location, larval stage and number at each stage, and pupae presence. The information was sent to The Nature Conservancy for review and a weekly data set was then forwarded to Suffolk County Vector Control. Vector Control staff mapped the larval distribution and reviewed the data for a treatment decision by the Director of Vector Control Tom Iwanejko. If treatment was considered necessary, a revised map was sent to the helicopter pilot to adjust the long-used “spray blocks” to target only the hot spots within the treatment area. According to Legislator Fleming’s office, results of the sampling “clearly demonstrated that the need for pesticides in certain locations was significantly lower than previously thought. The survey group detected mosquito larvae in only 544 of 6,000 samples. Data from the team showed that of the estimated 190-acre treatment block, only 70 acres showed breeding. Based on these data, the area to be sprayed was less than half. Ms. Fleming’s office estimated that the reduction in spraying saved the county $18,000 this year. 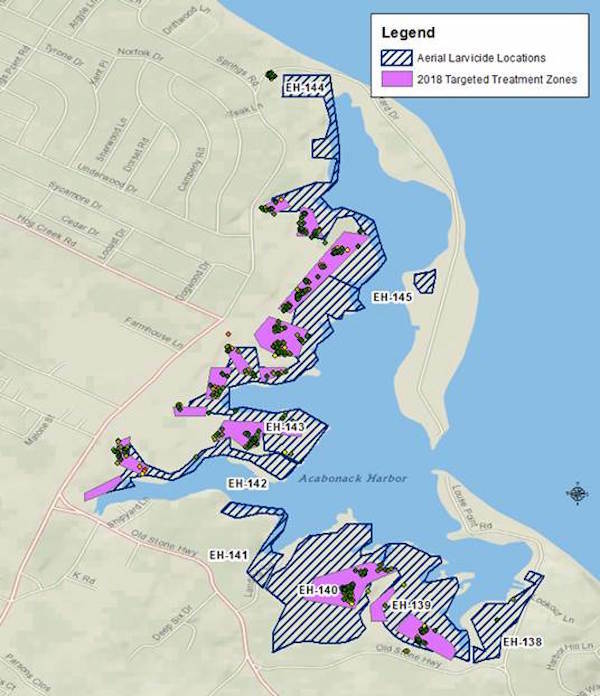 Instead of treating the entire spray blocks (crosshatched areas numbered on the map), only the hotspots with the mosquito larvae identified by weekly surveillance were treated resulting in much smaller treatment footprint (violet colored blocks) on the marsh. The 2018 aerial applications were targeted toward areas with heavy mosquito breeding. During 2018, Vector Control shifted more spraying to a quick acting and non-residual Bti and methoprene granule product, moving away from liquid sprays, which reduces drift issues and allows the helicopter pilot to target the upland marsh edge. The helicopters used for spraying travel just 50 feet above the ground to ensure accurate applications. The treatments targeted the points identified by the team, which showed that mosquito breeding was predominantly along the upper marsh edge, moving larvicide application away from the harbor and potential direct contact with the bay. The team is also identifying hotspots where movement of water can be achieved with simple wetlands restoration techniques to reduce breeding areas. For instance, during initial surveying in 2017, the team observed a sunken boat sitting in shallow waters that was harboring larvae breeding. The East Hampton Town Trustees removed the boat, eliminating the breeding area, and the need for larvicide applications at that spot.